HP has launched its 17-inch 3D Envy laptop this week in the US, with HP's UK office promising us that Brits will be able to pick up the machine 'in time for Xmas' in UK. It is the latest of the first few 3D laptops to hit the market over the last year, following earlier releases from the likes of Acer, Asus and Toshiba. The HP Envy 17 3D laptop features a nice and wide 17.3-inch 3D Ultra BrightView display and, unlike most of its competitors (which make use of Nvidia 3D Vision tech) this one uses AMD's 3D tech, coming bundled with the requisite pair of active shutter glasses. "With advanced 3D technology as well as Beats Audio and an HP Triple Bass Reflex subwoofer, this latest HP ENVY17 now also has the power and performance to deliver an unparalleled entertainment experience – just like in movie theatres," reads HP's marketing blurb. "Offering the best stereoscopic 3D visual experience without compromising 2D content, the 17.3-inch HP 3D Ultra BrightView Display provides crisp, 1,080p full HD viewing and an ideal visual experience for 3-D Blu-ray content. "HP 3D Active Shutter Glasses provide a seamless viewing experience by wirelessly synchronizing each frame of the 3D content between the display and the glasses." It all depends what your budget is, really. But it better be a healthy one, even if you are opting for the lowest specced 3D Envy from HP, because pricing starts at £1559 in the UK, and $1599 in the US. 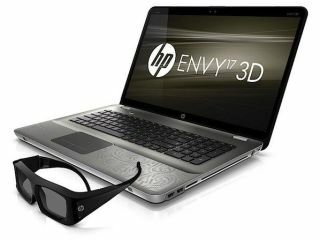 The HP ENVY17 3D is expected to be available from end of October in the UK. Additional information is available at www.hp.com/go/ENVY.